In 1945 the average person had to work a week to buy a ballpoint pen. There was only one ballpoint pen they could buy, the 'Biro'. It went on sale in May 1945 for 55 shillings (£2.75, or £80 in today's money) only in specialist stationers and upmarket department stores. The 'Biro' was a pen for the high-flying businessman - the only pen you could use on an aeroplane. Advertisements in the Financial Times, The Times and The Economist described its other features: a pen that would go six months without a refill; would make carbon copies as it wrote; would never leak; and would never blot or smudge. The Miles Martin Pen Company Limited, who manufactured the 'Biro', promoted it as a pen backed by an international network of dealers. You needed to return the pen to a dealer to replace the refill. It was not the cheap product we know today - it was the 1940s' equivalent of the first mobile phone. Before the Biro people wrote with fountain pens, ink dip pens or pencils. Fountain pens had a lever on the outside which compressed a rubber sac inside the pen. It drew ink into itself from a bottle when you let go of the leaver. There were more sophisticated versions which compressed the sac using a button the top of the pen, or vacuum fillers which created a vacuum inside the pen with a pump, and pens with partially transparent cases so you could see how much ink was left. All could leak and ruin your jacket. You needed to blot the ink after writing and the rubber sacs perished and were tricky to replace. School children used ink dip pens. They dipped a nib on the end of a stick into an ink well. It would write for a couple of minutes and then they had to dip it again. From my childhood in the 1970s, I remember our school desks had holes for ink wells, but the ink wells were long gone. Neither pen was convenient, so people used pencils for shopping lists, quick notes and seaside postcards. Many people never owned a pen. Fifteen years later, the same company sold better pens for just 9d (4p or around 50p in today's money), although they were Bics, not Biros. People called them throwaway pens and bought millions of them each year. Biro became the generic word for the ballpoint pen, just like all vacuum cleaners are called hoovers. People wrote their shopping lists and seaside postcards with a biro. The biro replaced the pencil, not the fountain pen. 'Biro' was the name of the inventor, Lazlo Biro, a Jewish Hungarian journalist. Frustrated by the inconvenience of fountain pens, he wanted to make a pen that used quick drying printers' ink. The ink would be delivered to a ball bearing point and would write dry without the need to blot. His brother, a chemist, developed a viscous ink that remained solid in the tube feeding the ball, but dried instantly as it touched the paper. With the rise of antisemitism in Europe, the Biro brothers left Hungary and for Argentina where they tried to market the first ballpoint pens. Their most pressing problme was how to make the ink flow smoothly out of the ball end, but not leak out of the other end. The ink reservoir needed a vent hole to allow air to replace the ink as the pen wrote, but a hole would mean the pen would leak. The Biros were on the verge of bankruptcy when Lazlo Biro met UK businessman, Harry Martin in a fashionable restaurant in Buenos Aires. Martin saw the potential of a pen that did not leak and could write at high altitude. It was perfect for RAF bomber crews and might help win the War. Martin secured the rights to make the pen in the UK and an exclusive licence to use Lazlo Biro's patent. He set up the Miles Martin Pen Company, a joint venture with Miles Aircraft Limited and helped the Biros create a reliable ballpoint. When the War ended Martin was ready to sell this new product in the UK. The first design looked like a large black fountain pen with discrete chrome trim. Mabie Todd & Company Ltd, makers of the 'Swan' fountain pen made the cases, so the resemblance was not surprising. However, the 'Biro' was going to replace the fountain pen, so it made commercial sense as well. Fountain pen makers struggled to get back to peacetime production as the War ended. So there were shortages of pens. As the 'Biro' was made for the war effort, Martin was ready to sell the new pen immediately. He took 15% of the entire pen market straight away. In spite of Martin's licence from Biro, he only had a monopoly trading position for two years and by 1947 other companies started selling ballpoint pens in the UK, and prices came down. Martin looked to the courts to enforce his licence and sued competitors for breach of copyright. He often agreed to licence the patent to a competitor for a fee. However, one case, The Miles Martin Pen Company Ltd v The Selsdon Fountain Pen Company Ltd, heard in front of Sir Charles Eustace Harman, determined the extent of Martin's monopoly. 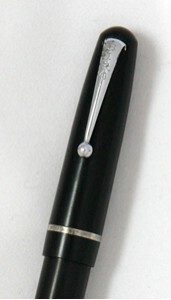 Selsdon was the second company to make a competitive ballpoint pen in the UK. Martin had already made a deal with his first competitor. Selsdon claimed that Biro's patent was invalid. The problem for Martin was that Biro did not invent the ballpoint pen. John J Loud, of Massachusetts in the USA, filed a US patent for a ballpoint pen in October 1888. There were several patents for improvements filed in different countries since. So Martin could not claim patent rights over ballpoint pens per se. However, none of these inventors produced a pen reliable enough to sell to the public. Biro did, so Harman ruled his invention must have brought novelty to the design of the ballpoint and could not be dismissed outright as invalid. Biro's patents described how he solved the problem he was struggling with in Argentina, how to deliver ink to the point consistently, in a pen that did not leak. Biro solved the problem, but did not understand why his solution worked. His patents described two methods. The first was an 'extended path', which he illustrated as a helical tube. His second patent talked about a 'capillary tube'. When this case was heard in 1947 the principle of why ballpoint pens do not generally leak was well understood. Capillary action prevented the liquid in a tube which is narrow at the top, but wider at the bottom from running out. The ballpoint pen had a narrow feed tube running to the ball and a wider tube in which most of the ink sat. So the capillary principle, which depends on the force from the meniscus (the small curved area at the top of the liquid) overcoming the gravitational pull of the liquid inside the tube, explains why ballpoint pens do not leak when held upside down. Biro found a way to make the pen work by trial and error. Harman did not insist that the inventor had to understand why his invention worked, only that he could describe it accurately. Biro's patent would stand or fall by his insistence that the tube had to be 'capillary'. 'Capillary tube', the term used by Biro, was familiar to the scientific community. It meant a tube of between 0.5 and 3.5 mm diameter. Harman ruled that any pen with such a tube was in violation of Biro's patent. Competitors were free to make pens with ink tubes of greater than 3.5mm in diameter. The Mentmore Company, which made the mass market Platignum fountain pen (they wanted to call it Platinum, but could not trademark the name of a precious metal), launched the Platignum ballpoint selling for five shillings (25p or about £6 in today's money) in 1950. In 1949, Mentmore took the precaution of filing a patent for the new pen which specified a refill tube exceeding 3.5mm and therefore not 'capillary' according to Harman's ruling. Scrib Limited launched the 'Scroll' pen in 1950 selling for the same price and there were others. Martin took Scrib to court and forced them to stop selling pens with 'capillary tubes'. Nevertheless Scrib became Martin's most successful competitor. Martin still had a considerable advantage over his competitors, even if the patent did not give him exclusivity. His success allowed Martin to buy a controlling interest in Mabie Todd, the makers of Swan pens. The new company became Biro Swan Limited. By 1956 Biro Swan had 45% of the UK ballpoint pen market, with Scroll coming in second with 22%. 'Biro' did not, however, become the definitive ballpoint pen. 'Biro' was the generic term for ballpoints but there was very little to distinguish a genuine 'Biro' from someone else's biro. The Biro Company took a long time to establish a house style. Their first design might have set the standard as the definitive luxury ballpoint, but Biro quickly abandoned it for a more generic looking pen. Biro often used other companies to make the cases and they all looked different. The price of the ballpoint pen dropped throughout the 1950s and sales rose astronomically. The first one shilling pen (5p or 80p in today's money) came in 1956. It was called the Zing pen, and it was advertised as 'the ballpoint of the future'. It was the ballpoint pen of the future only in terms of the price; the pen itself wrote badly. On the other side of the channel, Frenchman, Baron Marcel Bich (he was a real Baron), understood what the ballpoint pen of the future should look like. As early as 1950 he launched the Bic Cristal in France. The Bic Crystal did not look like a fountain pen, it looked like a pencil. It was hexagonal and was made from clear plastic so you could see how much ink was left. It was not initially disposable as Bich sold refills, but it was incredibly cheap. Bich felt people would not mind if they lost a Bic. He succeeded, where Zing had failed, by making the pens to very high standard of precision, similar to that of a Swiss watch according to the French newspaper Le Monde. However, the Bic factory turned out millions of pens and was able to do so for a remarkably cheap price. Bic (pronounced 'Beek') was a huge success and became part of French culture. Although the Bic had been selling in France since 1950, it was not simple to export it to the UK. Martin's exclusive patent was one obstacle, but trade between France and Britain was by no means free in the 1950s. Martin's rights extended as far as Europe. He successfully defeated Bich in a French court case and was already collecting royalties from Bich. Nevertheless Bich was hugely successful, so much so that he bought a controlling interest in Biro Swan in September 1957. In August 1958, Biro Swan launched the Bic range in the UK. The Bic Crystal, still in production today, sold for one shilling. The Bic was not only cheap, but unlike the Zing, it was reliable and wrote well. It even impressed The Consumers' Association Magazine, 'Which?'. They recommended Bic pens for writing quality, as well as economy. The Biro branded pens were only rated for robustness. Ballpoint pen sales increased year by year, from ten million in 1952 to sixty million in 1958. People bought more ballpoints than they had ever bought fountain pens. Fountain pen sales did not collapse overnight. One reason was that many head teachers were suspicious of ballpoints and insisted pupils used proper ink pens. Another was that people still kept a fountain pen for best, but used a biro for day-to-day. People used ballpoints for quick notes, shopping lists and seaside postcards. The ballpoint was replacing, not the fountain pen, but the pencil and pencil sales were declining. Although cheap pens made up the vast majority of pen sales in the late 1950s, they were not hugely profitable for the pen companies. Most continued to sell more expensive models and people still bought in them large numbers. Pens were popular as gifts at Christmas and for birthdays; a one shilling Bic would not have made a great gift. In 1954 Parker launched the Jotter in the USA, it came to the UK in 1958 replacing Biro as the quality ballpoint.